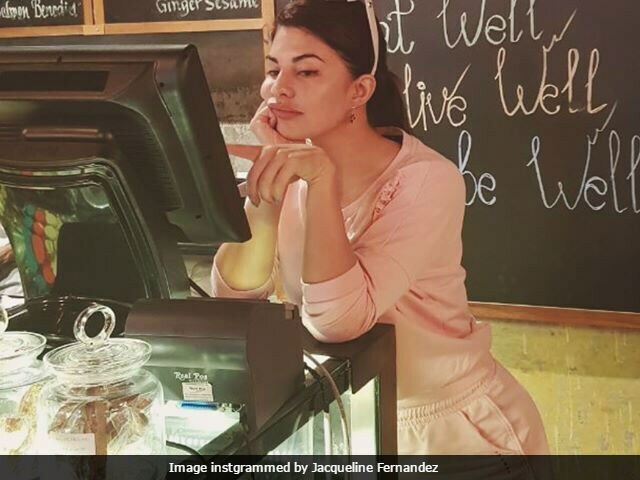 Actress Jacqueline Fernandez, who is currently prepping for her upcoming release A Gentleman with co-star Sidharth Malhotra, recently posted a picture of herself on Instagram where she can be seen standing at the counter of a fitness cafe. Sharing her picture, Jacqueline disclosed a secret about herself that would definitely leave her fans surprised. The Roy actress revealed that she worked as a waitress when she was a teenager. Jacqueline Fernandez recalled the old memories and wrote that she had a part time job as a waitress when she was all of 14. Jacqueline, who is not from a film background, featured in films like Kick and Race 2, which did well at the box office. The Housefull 3 actress also posted a picture on Instagram where she can be seen writing an order at the cafe's counter. Jacqueline Fernandez is smiling in the picture which indicates that she's happy recalling her old memories, when she used to be a part time waitress. Jacqueline also posted a very adorable picture in which she's covering her face with a tissue and holding a fork in her hand. Jacqueline Fernandez, who is a fitness freak, expressed her love for healthy food in her recent Instagram posts. She has mentioned hashtags like #healthy, #happy, #fit which indicate that she's happy to consume healthy food. So it's the end of my 7 day juice cleanse!! I did the master cleanse for 3 days and the fibre cleanse for the remaining 4 days (2 soups included) I obviously had cravings and felt super hungry at times (missed coffee a lot) but realised that we have a lot more will power than we know! It's an amazing way to reconnect with your inner voice! I had so much energy today I've been wanting to do a shoutout to an amazing inspiration of mine @yellabella for her amazing work in yoga anywhere anytime (ignore my goof ups)!! @rawpressery thanks for the juices! Jacqueline has been cast opposite her Brothers'co-star Sidharth Malhotra in upcoming A Gentleman. After Brothers, Jacqueline and Sidharth rocked the (in) famous Koffee couch, for which they received several compliments. A Gentleman, directed by Raj Nidimoru and Krishna D.K will hit the screens on August 25. The film is produced by Karan Johar.